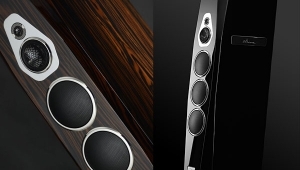 I am biased in favor of Paradigm loudspeakers. I've used them for 10 years; they offer good sound and good value, properties they share with a number of other Canadian makes who have taken advantage of Canada's National Research Council facilities in Ottawa. 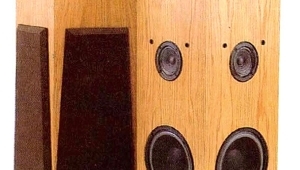 In fact, the first components I bought specifically for what is now my multichannel system were Paradigm Esprit/BP speakers, which had impressed me at a Stereophile show. 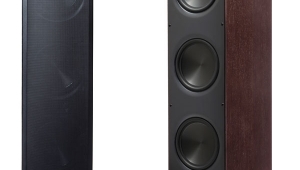 When I took the step into multichannel and found that there wasn't a matching center-channel speaker for the Esprits, I replaced them with Paradigm's Reference Studio/60 v.2s. 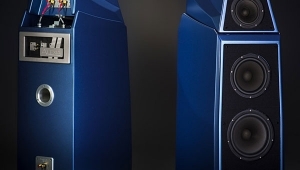 But while the smaller Reference Studio/20, and the larger Studio/100 have both been reviewed in Stereophile, the Studio/60 had not. 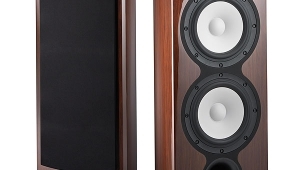 The release of the v.2's successor, the Reference Studio/60 v.3 ($1699/pair), was an opportunity to fill that gap. 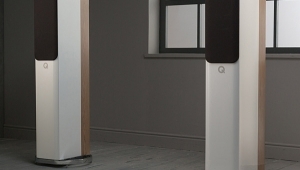 The Studio/60 v.3 is a gracefully proportioned but simple 2½-way tower with two 7" mid/bass drivers and a 1" tweeter. It is significantly larger, though lighter and more complex, than its predecessors. A rap with a knuckle produced a sound of slightly higher pitch and lower amplitude than it did from the v.2, suggesting that the v.3 is both more rigid and less resonant. 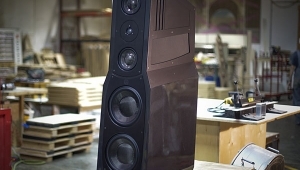 This may be due to the v.3's more complex cabinet construction and driver mounting, as well as to the cabinet's curved rubbery top, which surrounds the slightly protruding cowl enclosing the aluminum-dome, ferrofluid-cooled tweeter. 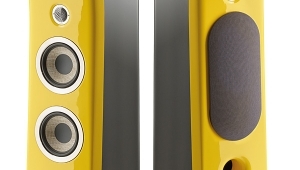 Other external differences from the v.2 are the v.3's front and back ports and the very substantial, stationary brass phase plug on its upper mid/bass driver. That driver has a mica-polymer cone and a 1.5" voice-coil; the v.3's second-order crossover hands off the signal to the tweeter at 2kHz. 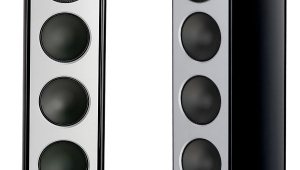 The lower bass driver, which is rolled off above 500Hz, is similar but has a mineral-filled polypropylene cone. All three drivers have diecast chassis and are resiliently mounted to the cabinet to minimize transmission of vibration via any medium but air. (Paradigm calls this system IMS/Shock-Mounting.) The removable front grille consists of an open-weave black fabric stretched over a plastic frame. 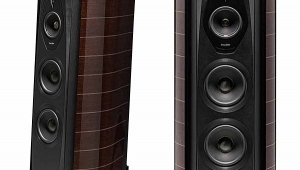 My reference Revel Ultima Studio speakers were given a brief vacation in the next room, and the Paradigms were connected to an admittedly overkill system—see Sidebar— that the Reference Studio/60 v.3s are unlikely to encounter in real life. 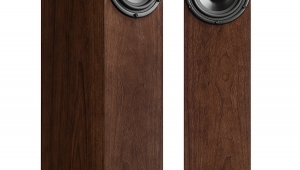 But they were not embarrassed, sounding very much like the $10,000/pair speakers they'd replaced: ample, balanced, and open. In fact, in overall balance, there was little to choose between the Revels and the Paradigms. The latter were as full and warm as the Revels, but with excellent and spacious treble, and the stability and dimensions of their soundstage were impressive. 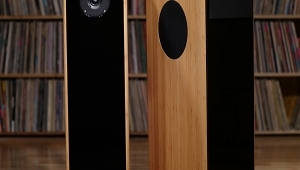 Over the month that the Studio/60 v.3s were driven by the Theta Gen.VIII and Classé Omicron monoblocks, they were consistently satisfying with all types of music, from large orchestral and choral pieces to smaller vocal and chamber works. In the details, however, I did find areas that clearly favored the Revels. 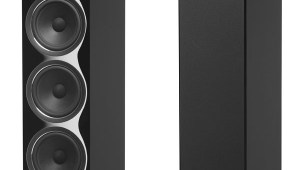 First, in the extreme bass, the 60 v.3s' smaller drivers and considerably smaller enclosed volume could not quite load my large room (15' by 32', and open to other rooms) with either the pounding bass of rock or the imposing gravitas of the pipe organ, as could the Revels. On "Piano Smasher," from Blue Man Group's The Complex (DVD-Audio, DTS Entertainment 69286-01120-9-4), the tubular percussion was just dandy, with rounded resonance, but the bottom end of the triadic piano smashes was weak compared with the Revels. Second—and, again, only by direct comparison with the Revels—female voices, so limpidly clear via the Revel's smaller, more sophisticated titanium midrange cone, were ever so slightly veiled through the Studio/60 v.3.